There are several ad optimization techniques that can help you make the most out of your PPC investment. When done right, they can produce great results on your AdWords and Facebook advertising campaigns. Whether your brand has one location or 1,000, optimizing your paid search and Facebook ads for local customers can help you generate more conversions and revenue. On June 13, I moderated a Marketing ThinkTank webinar sponsored by DialogTech. Presenters Blair Symes and Katie King discussed proven localization strategies all businesses can use to drive more customers from AdWords and Facebook campaigns. Paid search and Facebook ads dominate digital ad spending in the U.S. as advertisers demand “more granularity in targeting capabilities to reach consumers.” Local ad spend is likewise growing particularly on Google and Facebook. 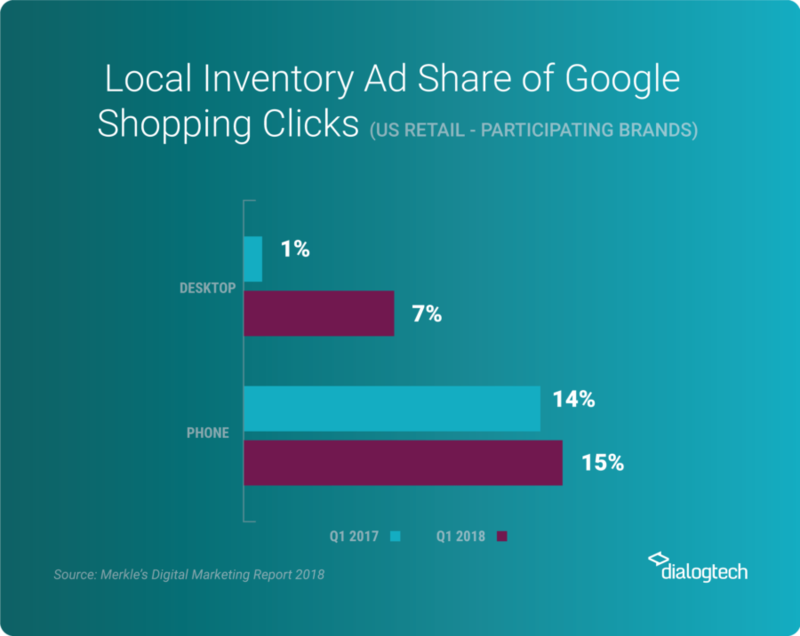 More consumers use the local information found in ads (specifically the link for directions and the click-to-call button). With these in mind, brands must optimize ad campaigns at every touchpoint to make it easy for consumers to convert however and wherever they want. Here are 10 local strategies that can help you drive more customers from your AdWords and Facebook ads. Location targeting is helpful for reaching audiences within your service area. Both Google AdWords and Facebook allow advertisers to target audiences by country, state, city, or ZIP code. 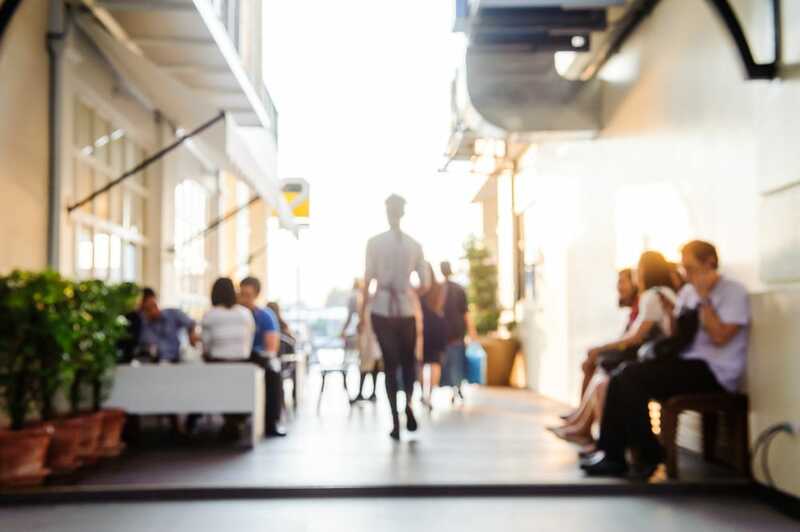 Use data that are readily available in your CRM to determine the location of your customers. Writing a geographically relevant ad copy can encourage consumers to call your business. According to Google, four in five consumers want ads customized to their city, ZIP code, or immediate surroundings. You should always make sure that the language in your ads speak to the location you are targeting. A recent DialogTech study found that nearly one in five calls driven by paid search goes to voicemail. Further, 57 percent of the voicemail messages from callers signaled buying intent. This represents lost opportunities to convert callers into customers. To prevent wasting ad spend, you may use ad scheduling to make sure your ads only show up when your business is open. Ideally, you should run your ads during normal business hours and when someone is available to answer the phone. Mobile searches bring customers to your front door. More than 75 percent of people who search on their smartphones for something nearby visit a business within a day. This is why you might want to increase your bids for searchers using mobile devices. Inbound calls are valuable conversions that should not be ignored. Make sure to place your phone number prominently in your ads to encourage audiences to connect with you. The click to call feature is widely used by consumers across all verticals. 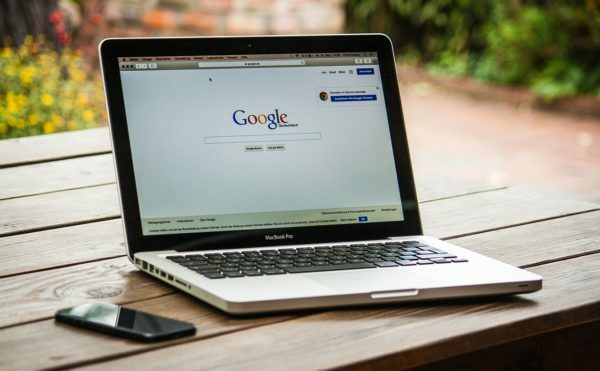 Google found that 70 percent of mobile searchers have called a business directly from search results using this feature. Alternatively, you can also use call-only ads if you prefer to get calls and not clicks. To drive more conversions, you may also retarget local customers using their email address or phone number. Show audiences relevant ad campaigns that will incentivize them to call again. Targeting lookalike audiences that resemble your most valuable callers is also a good option. Facebook enables advertisers to choose a marketing objective (i.e., Awareness, Consideration or Conversion) when setting up ad campaigns. Try different objectives that may apply to your ad campaign and evaluate the results. Using data is an indispensable part of optimizing your ad campaigns. They can provide insights as to what really drives conversions and help you improve ad targeting. It’s always better to take data-driven steps so you can optimize your digital ad ROI. You invest in digital campaigns: You place ads on Google AdWords, Bing, Facebook, or the Google Display Network. You generate conversions: Your ads yield online, phone call, and in-person conversions. You measure their value: Is it a sales lead, sales opportunity, appointment, new customer, or repeat customer? You determine next actions: Retarget, lookalikes, or exclude. You optimize for what works best: Marketing channels, campaigns and ads, search keywords, or webpage variations. This approach works well for online conversions, but what happens when people call? 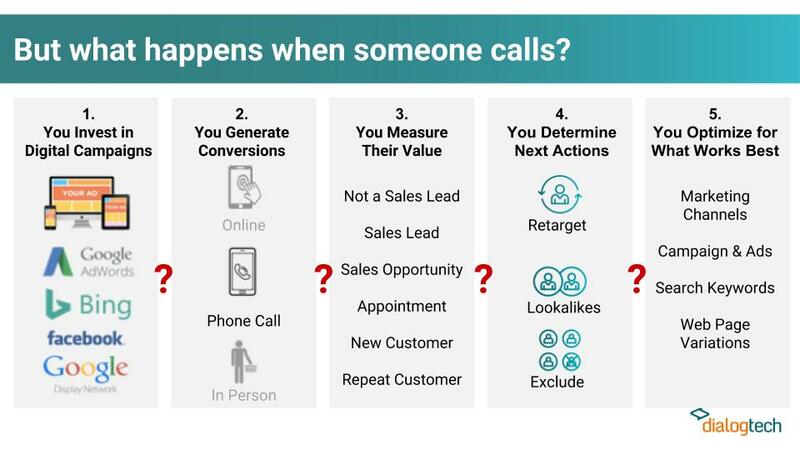 If your company doesn’t use call analytics, you might be missing out on a wealth of marketing insights that you could’ve captured through phone calls. Compare local numbers vs toll-free numbers. Compare calls from SERP vs. website. Integrate call data with marketing and ad platforms. Measure calls from marketing source to sale. What happens when customers call your business can impact your ROI. Poor customer service or negative call experience may push callers to cease doing business with a company. Caller passed from agent to agent. Agent not knowing why a caller is calling. Connecting callers with the best location or agent right away increases customer conversion rates. If you have call centers, route callers by the marketing source that drove the call. If you have multiple locations, route callers by their location or the day/time. IVR technology can enable you to have callers determine how best to route them. It can qualify callers and only route good leads to agents. If you know calls from specific marketing campaigns convert best, prioritize those callers so they are answered right away. For instance, you may want to place calls driven from Google AdWords and Bing Ads to your VIP call queue, and those from Facebook, TV or radio ads to your regular call queue. When you’re using a call tracking solution and your marketing interaction generates a call, analytics on the caller will be presented to the sales agent. The sales agent can see information on the caller and their location, as well as which marketing source drove that call. This information is valuable because it allows the sales agent to frame the conversation in a way that will provide a more personalized and seamless experience for the caller. What percentage of calls to each location go unanswered or to voicemail? How many calls are good leads versus non-sales calls? Which sources (channels/ads/keywords) drive the highest quality sales calls? What days and times drive the most (and best) calls? Are some locations better at converting calls? What are they doing differently? There are two options for analyzing conversations. Calls to every location from your marketing are recorded and transcribed for you to review. Drill into calls to any location for marketing insights. AI and machine-learning algorithms do the analytics for you, measuring caller intent, sales agent performance, conversion rates, and more. Analyzing conversations can help you understand whether calls are converting and why. It also allows you to put callers in the right audience segments. Put callers who didn’t convert into retargeting campaigns. Use your best callers to find more valuable lookalike audiences. Put callers who bought products into upsell or cross-sell campaigns. Suppress callers from seeing ads that aren’t relevant to them. Further, with the help of call data, you can target callers with their own digital ad campaigns. Calls are valuable signals to help you determine the keywords and bid amounts to target them and the best ad and landing page messaging for someone who likes to call. Watch the video recap of the webinar presentation and Q&A session below. Check out the SlideShare of the presentation as well. Want to create top-ranking content that satisfies both the search engine and the user? Join our next webinar on Wednesday, January 30 at 2 PM Eastern as we take a deep dive into content strategy for 2019 and beyond.